A fantastic gift for any mom-to-be! 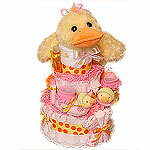 Soft and sweet little Duck (rattle teether toy) sits on top of one-tier Little Pink Duck Diaper Cake. 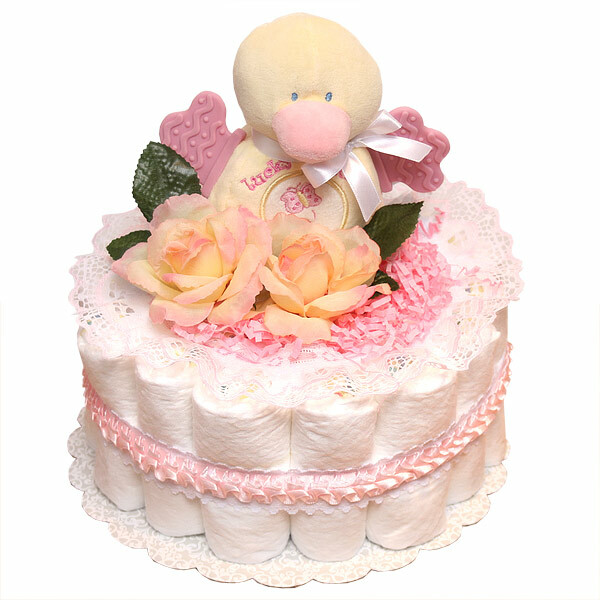 This cake consists of 25 rolled Pampers Swaddlers diapers size 1-2 (8-15 lbs. ), wrapped with a classic lace ribbons. Decorated with crinkle paper and silk flowers. Toy is CERTIFIED Asthma and Allergy friendly. Meets ASP:01:01 standard for stuffed toys. Safe for all ages. 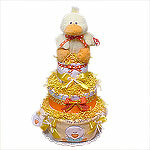 Duck Diaper Cake for a Girl!